Our May, 2017 newsletter will be available online at Dr. Krohse's Blog. If needed, please use the links in the footer to opt out or change your account. Wake, walk, hug, run, & compete without pain! The following video may not be suitable for work! 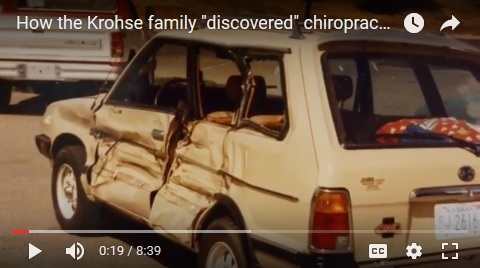 Dr. Krohse recently recorded the powerful story of how his family "discovered" chiropractic. Occasionally this hard-to-believe story of trauma and healing brings tears to people's eyes so just as a warning, your coworkers may wonder about you if it affects you that way. Ready to stop letting pain be your new normal? 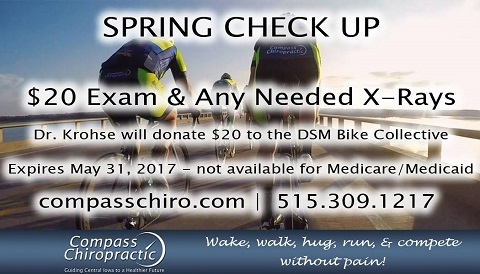 Through the end of this month, call our office and mention our spring check up promotion described below and we'll do our best to determine the specific causes of your pain and lay out a simple but effective plan to have you feeling back to your old "normal." Jon Kabat-Zinn is (in my opinion) the guru of mindfulness. And mindfulness, in its simplest form, is a mental state achieved by focusing one's awareness on the present moment, while calmly acknowledging and accepting one's feelings, thoughts, and bodily sensations. Many medical providers use or recommend this as a therapeutic technique. Kabat-Zinn's major research interests have focused on mind/body interactions for healing, clinical applications of mindfulness meditation training, the effects of mindfulness based stress reduction (MBSR) on the brain, on the immune system, and on healthy emotional expression while under stress. I have experienced and observed that many friends and family -- irrespective of political beliefs and affiliations -- have found the most recent cycle of politics to be a source of stress. For those seeking a better sense of calm during trying and stressful times -- whether from politics, health, family circumstances or whatever the source, check out mindfulness and some of the many wonderful books Jon Kabat-Zinn has authored on this topic. 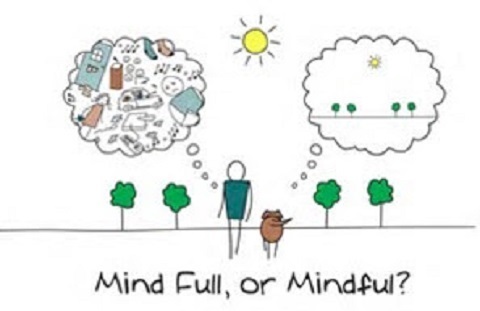 I encourage you to also google mindfulness and you will find a wealth of information on this most interesting (and useful) subject as well as free online recordings for meditation. I was recently channel surfing while folding laundry and stopped when I heard this amazing voice singing one of my favorite songs - "Chandelier" by Sia. 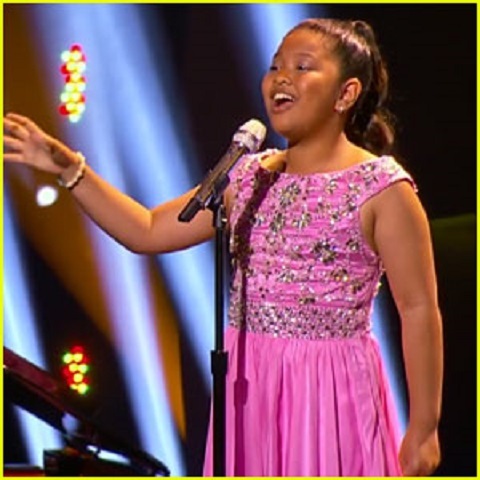 I was amazed when I learned that the beautiful voice belonged to a 12 year old girl! Her name is Elha Nympha and she is from the Philippines. The show was called "Little Big Shots" hosted by Steve Harvey. Elha definitely fits the category of a Little Big Shot if you ask me. Such talent at such a young age! This little lady has a bright future ahead of her. I got goose bumps listening to her sing so I just had to share! Enjoy! I saw this recipe on the Rachel Ray show a couple weeks ago. It looked & sounded so good I just had to try it! I love mushrooms so I figured I just couldn’t go wrong. 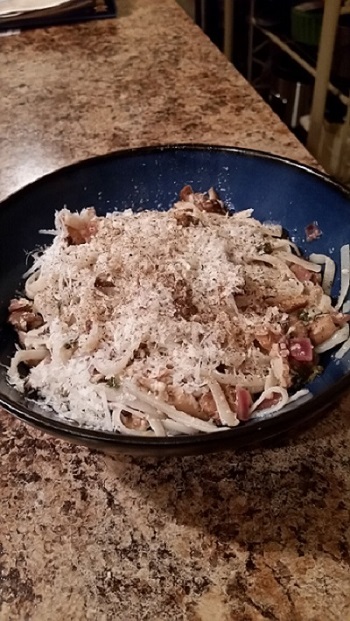 Of course, I used gluten free pasta and shrunk it down to a smaller scale portion size for one. And it was AMAZING!! Bring large pot of water to a boil for pasta. Place the dried porcinis in small saucepan and add just enough stock to cover them. Bring to a low boil then reduce heat to medium-low and simmer until softened, 2 to 5 minutes. In large skillet, heat olive oil over medium-high. Add butter to the pan and let it melt into the oil. Add the mushrooms and cook, stirring occasionally until brown, about 3-5 minutes. (May have to cook them in two separate batches.) Add shallots, garlic, herbs and lemon zest. Season with salt and pepper. Cook stirring often, until the shallots soften, about 2 minutes. Cook pasta to just shy of al dente. Using slotted spoon, transfer porcini mushrooms to a work surface and chop. Add them to other mushrooms mixture along with the liquid they soaked in, leaving behind the grit on the bottom. Add about half bottle of wine, (as other half is for cook to drink) and bring to a boil. Reduce heat and simmer until slightly reduced, about 3 minutes. Drain pasta and add to sauce, toss over medium-low heat until pasta is al dente and has absorbed some of the sauce, about 3 minutes. Remove from heat, stir in lemon juice and 1 cup of cheese. Drizzle with EVOO to marry sauce to pasta, top with chives and more cheese if you like. ENJOY! 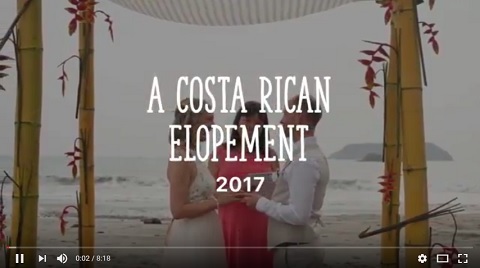 Val and I had the most amazing time eloping in Costa Rica. We loved our stay at Gaia Hotel and Reserve and were amazed by the beauty of Costa Rica as well as the friendliness of the Costa Rican people! Below is a slideshow featuring some of the highlights of our trip. Copyright (C) 2017 Compass Chiropractic. All rights reserved.